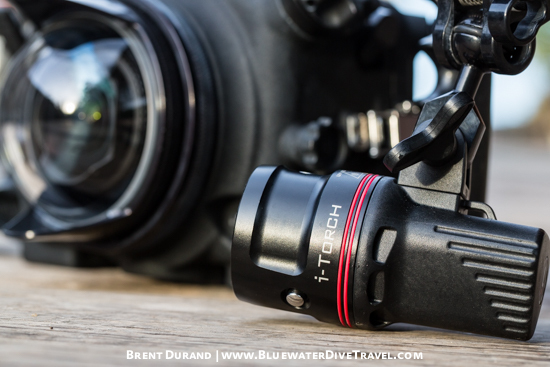 The I-Torch Venom38 is setting a new bar for underwater video. The light boasts a stunning 3800 lumens in a compact, lightweight body. It has a very wide and smooth 120 degree beam and both red and blue (UV) light modes. 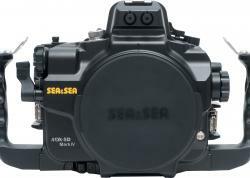 Listed on Bluewater Photo at a very aggressive price, this is a light underwater video fans will want on the next dive trip. The Venom38 has a smart, stylish design. Video shooters know that you can burn through lights quickly when there's lots of good action, so the detachable and rechargeable battery is a great feature on the lights. Pick up a couple extra Venom38 batteries and you can shoot all day, then recharge them all at night. Dual o-rings ensure a firm seal of the battery to the light (as with all o-rings, make sure they are clean and free of debris). The 3 light modes (white, red, blue (UV)) is cool, but what is even nicer is that you have two buttons to control them. No need to cycle through all these functions and make your dive buddies think you've having a private disco party. One button turns the light on/off and cycles between white, red and blue light. The other button adjusts the light intensity of the current mode (i.e. 4 levels of white light). Lastly, the lights have a digital battery power indicator to let you know exactly how much power you have. In my experience they were dead accurate. 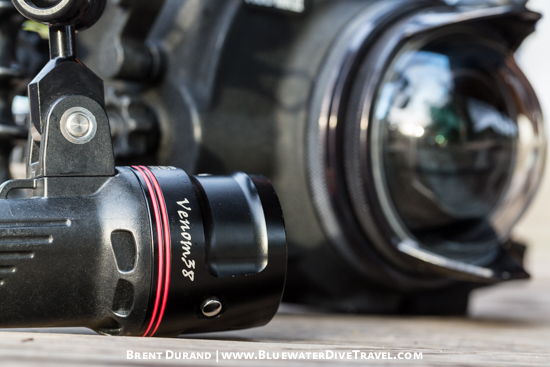 The Venom38 lights perform well underwater for both wide-angle and macro video shooting. The beam is very smooth, with no visible hotspots. 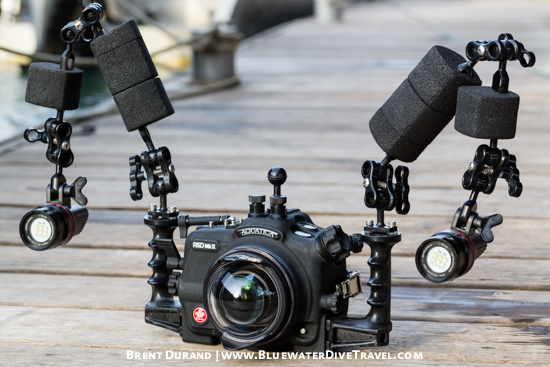 The small size of the lights make them easy to position and swim with underwater - you can see my Papua New Guinea setup below for our fishy & sharky current dives. As mentioned above, the dual push buttons made switching the lights on/off and between power levels easy and less disruptive. 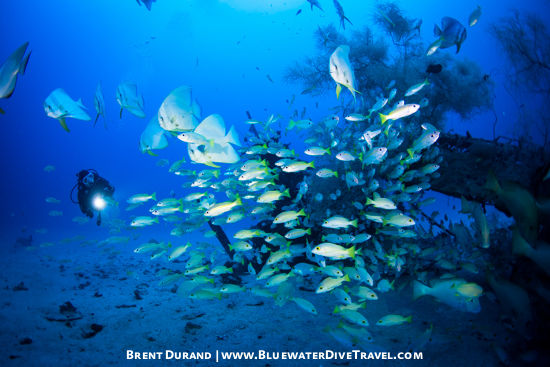 Shot during two dives in Bali, Indonesia, edited and published same day during Bluewater Travel's Best of Southeast Asia tour. Want more sample underwater video? 15+ videos are posted on the Best of Southeast Asia webpage - browse for video shot in Bali, Manado & Bunaken, Lembeh Strait, Raja Ampat and Papua New Guinea. 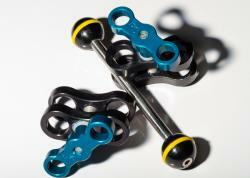 Learn more and purchase the I-Torch Venom38 at Bluewater Photo. 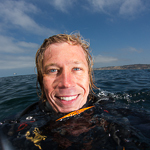 Brent Durand is an avid California beach diver, photographer and writer dedicated to capturing unique underwater, ocean lifestyle and adventure images. 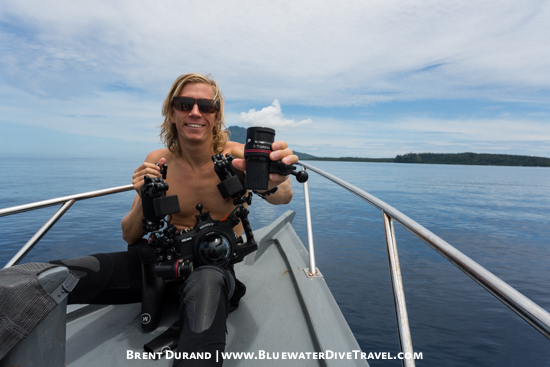 Brent is editor of the Underwater Photography Guide. 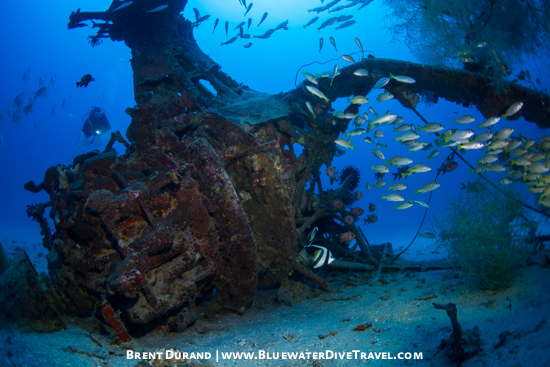 Follow UWPG on Facebook for daily photos, tips & everything underwater photography!